A vehicle used by the Iowa Highway Patrol when the organization was founded 80 years ago has been restored and returned to service. Iowa Secretary of State Paul Pate helped lead a rededication ceremony for the patrol car outside the statehouse this morning. 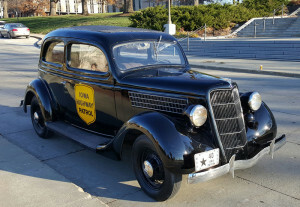 Volunteers helped restore the 1935 Ford Tudor which had been donated to the state and spent several decades in the basement of the State Historical Building. “It was in storage and it was kind of forgotten, frankly,” Pate said. Students in the Des Moines Schools’ automotive technology program and students at Des Moines Area Community College worked to restore the vehicle over the past year. Pate wouldn’t speculate what the 80-year-old car might be worth. “I don’t think you could put a dollar value on it because it’s more than just a car…the history of it, I wouldn’t even want to put a price tag on it. It’s priceless,” Pate said. 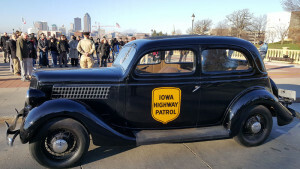 Iowa Department of Public Safety Commissioner Roxann Ryan spoke at today’s ceremony about the 53 men who were hired 80 years ago to be part of the Iowa Highway Patrol. “At that time, in 1935, patrolmen were paid $100 a month and they patrolled from six in the morning to six in the evening,” Ryan said. 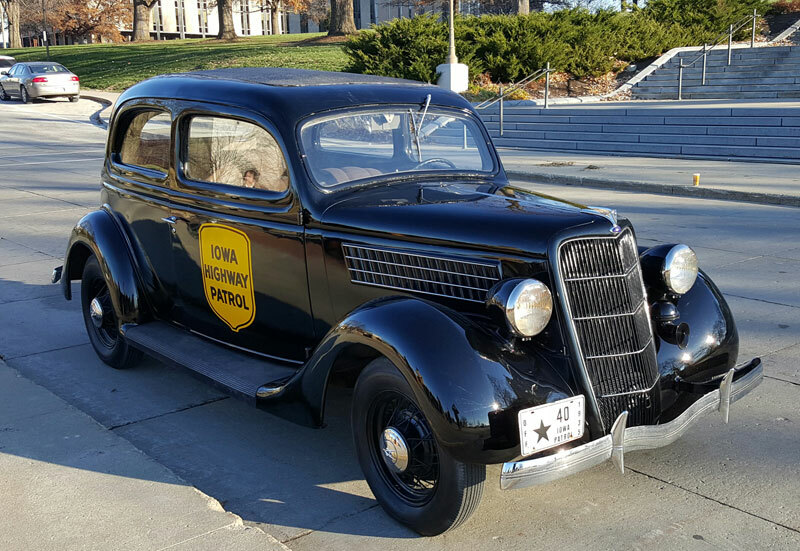 The 1935 Iowa Highway Patrol vehicle will make appearances in parades and other events around the state.